July 1, 2016 marks the 100th anniversary of the infamous Jersey shore shark attacks in which four people were killed, one injured over twelve days and the entire coast was stricken with terror. The first of the attacks occurred in Beach Haven. 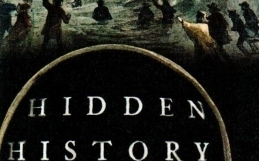 These events spawned serious studies into shark behavior along with the book “Jaws” by Peter Benchley and several movies with the same name. 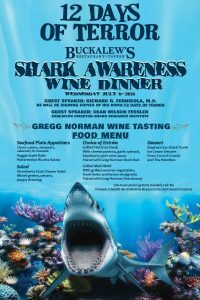 To recognize this event in Beach Haven’s history, the NJ Maritime Museum and the Shark Research Institute have joined together to present “12 Days of Terror”, a Shark Awareness wine dinner at Buckalew’s Restaurant – Tavern, 101 North Bay Ave, Beach Haven, Wednesday, July 6, 2016 from 5 pm to 9 pm. 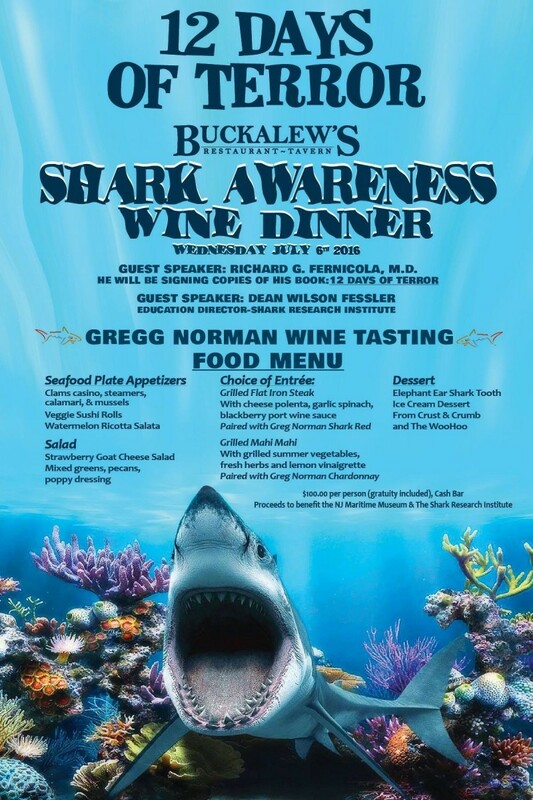 A four course dinner is planned by Buckalew’s along with wine tasting provided by Greg Norman Wines. The food menu is shown below. Guest speakers for this event include Richard G. Fernicola, M.D., author of the book, “12 Days of Terror”. Dr. Fernicola will be signing copies of his book which will be available for sale at the dinner. Also speaking will be Dean Wilson Fessler, Education Director for the Shark Research Institute. Dean has delighted audiences several times with his presentations at the museum. Tickets to the dinner are $100 per person (gratuity included). A cash bar will also be available. 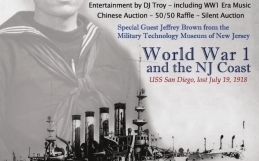 Tickets are available by cash, check or credit card at the New Jersey Maritime Museum, 528 Dock Road, Beach Haven. The museum is open for summer hours, every day from 10:00 am to 5:00 pm. Or by credit card on the museum web site. 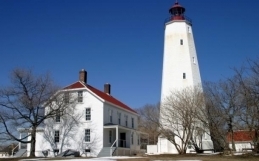 Go to www.njmaritimemuseum.org ; point to ABOUT; then click on DONATE. Click on the button “Enter Other Donation Amount” then specify the amount for the number of tickets you want. Under the Donation Designation, click on “General”; In the Notes box, enter “Shark Dinner”. Please be sure to provide all the name and address information. On-line ticket purchases will be confirmed via e-mail. Please specify if you want your tickets mailed or held for you at the Buckalew’s front door on the evening of the dinner. 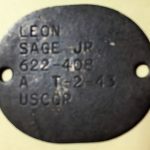 For more information, call the museum at 609-492-0202. 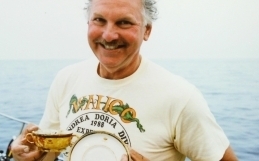 Proceeds from this dinner will benefit the NJ Maritime Museum and the Shark Research Institute. This is a good cause and a great opportunity to learn more about the events that shaped several generations of attitudes toward sharks. Buckalew’s, July 6. See you there. 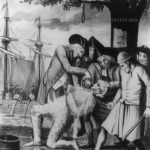 What Happened To British Loyalists After The Revolutionary War?